We have many people asking us daily about how to build axe throwing lanes. And we have many of the rules and regulations online that you can read here. 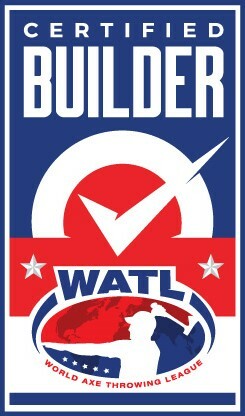 But we are very excited to announce that we have worked extensively with Global Fun Pros to make them the first WATL builder. With more than 50 years of combined experience within the Family Entertainment Industry, and working with us to make sure they have the most up to date and accurate specs available for axe throwing buildouts, they are sure to have answers to any questions you may have regarding building your new axe throwing venue or products and services of any kind. They also can help, Design, Build, Supply and Coordinate all construction and equipment for your future facility. We have all of the skills and recourses that you’ll need to build and open your family entertainment. Content, investment, phased development, project efficiency, operational dynamics, cash flow requirements are all outline and positioned during our strategy and project build phase. Global manufactures Cutting Edge axe throwing lanes to meet safety requirements of insurance groups. Global already works with insurance companies that will insure your facility, this makes bringing in axe lane easy and simple! This includes proper safety walls as well as flame resistant wood. Also as an exciting announcement. WATL will be joining Cutting edge to bring axe throwing to the IAAPA Attractions Expo in Orland Florida next week! The International Association of Amusement Parks and Attractions (IAAPA) represents over 5,300 amusement-industry members in more than 100 countries worldwide and operates several global amusement-industry trade shows. Its annual IAAPA Attractions Exposition (IAE) in Orlando, Florida is recognized as the world’s largest amusement trade show in the number of attendees and exhibitors and providing members insight into current amusement trends, laws, operations and industry methodology. We are extremely thrilled to be bringing Axe Throwing to this huge event and if you’re in the Orland Area please make sure to stop by and say hi! If you can’t make it, make sure to check out our instagram for stories being shared all week!